The sun is peaking through, the temperature is rising and we’re starting to look forwards to a glorious summer. Well we can hope can’t we? How about some ideas on how to create the perfect contemporary garden? One that’s ideal for outdoor living, for entertaining and socialising and for hosting a mountain of garden parties and get-togethers. I’m not a gardener so over the years have found that a contemporary look works best, with architectural plants that need minimal care, and tall planters, plenty of seating and a space for everyone. Here are some of my ideas, with plants, materials and furniture and accessories to complete the space. However much space you have, give some time to careful planning and use of the space. You want to create a haven of relaxation, a space to which you can retreat either alone or with the family, and need to make the best use of all of your space. A garden designer can help, but most people can give it a go themselves, ensuring you inject your personality into the garden, making it uniquely you. Ensure everything coordinates to ensure cohesion and impact for your look. Stick to one theme; sleek and minimal for a contemporary look. Use angled, clean lines and muted shades, adding pops of colour here and there. Paint walls grey or black for a striking backdrop to your plants, and try to keep it as unfussy as possible. The furniture has to really tell the story of what this garden is. I’ve been hunting the Harley and Lola website, finding key pieces that work with my scheme. It hasn’t been difficult. From polycarbonate leaf chairs, to large daybeds and curved dining sets, I’ve been spoilt for choice. Pieces like this are often an investment so choose wisely and buy the best you can afford. The perfect outdoor urban jungle needs plenty of plants. Keep them architectural, evergreen and spiky for an authentic look. Line the same plant along pavements and borders, or in pots for maximum impact and uniformity; a look essential to contemporary styling. Research the best types for shade and sun. Mix different height planters in small pockets for a stylish display. 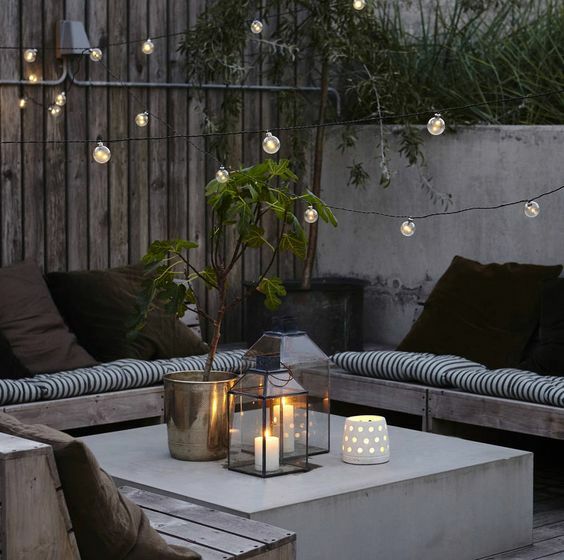 It’s often a last-minute thing, and we light a few tealights to give our gathering some ambience, but if you think carefully about garden lighting you can really give the space a stunning impact and make it more usable. Add pavement lights, highlight trees, light water, hang fence lights and put in flooring lights on decks and patios. Some of this takes planning, but some solar pieces can be added in after a garden is built. You can find more inspiration on my Pinterest board, where I’ll continue to add ideas and suggestions for how to create the perfect contemporary garden room over the next few months. Follow Jen Stanbrook’s board The Modern Garden Room on Pinterest. Some great ideas here, Jen. Outdoor furniture has come a long way, hasn’t it. There are some lovely ideas on your pinterest board too. I’m still getting the hang of pinterest (plus need more time to populate it!) but I have pinned this post so I can pop back and grab some more ideas soon. Thanks for doing all of the research on this and sharing! Some really great ideas for the garden. I’ll show them to my mother. She’s just arranging hers. Thanks for the inspiration. Great post, Jen! Tell me though, which grass option would you prefer – faux grass or real one? Beautiful! I’m loving these pictures and ideas! That’s just too chic! Some great ideas for my own garden right here, thanks! Great ideas, what kind of setup would you use in a very very hot climate, shade is a must and any thing we can do to keep temp down. We live in the high desert and my wife wants to “decorate” a spot in the yard so she can sit and read. Very nice ideas. Inspires you to sit and relax! We like the little lights and candles!